Wherever you need a smooth finish that is easy to clean, low maintenance and abuse resistant, TRUSSCORE PVC Sanitary Wall and Ceiling Panel has your project covered. TRUSSCORE PVC Wall and Ceiling Panels are designed to exceed your most demanding expectations. They meet and/or exceed modern hygienic construction and statutory building codes; and are transforming construction practices in Canada and the United States. TRUSSCORE’S unique truss design and heavy wall thickness provides industry leading spanning properties and high strength. TRUSSCORE’S surface is highly durable and resistant to scratches, chemicals and moisture. Industry leading 1/2 inch thick panel combined with unique inner webs gives Trusscore outstanding strength not found in thinner panels. Cost effective vs other wall systems like painted drywall. Made from 100% virgin PVC, Trusscore is highly resistent to chemicals and unaffected by moisture. TRUSSCORE PVC Wall & Ceiling Panels have your job covered. Wherever you need easy-to-clean, low maintenance hygienic or abuse resistant paneling. TRUSSCORE is available in standard 8, 10, 12, 14, 16, 18 and 20 foot lengths. Custom lengths are available. 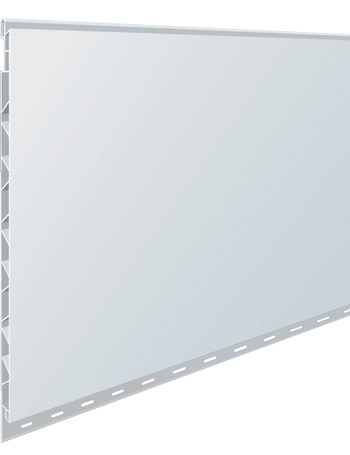 TRUSSCORE PVC Wall and Ceiling Panel is available in 16″ width. Zero growth for bacteria and fungi using ASTM G21 & G22 tests.